Japanese noodles, well actually, ramen originated from China but the Japanese have adopted it, added some extra features and made it their own. I judge ramen by the size and quality of the charsui(roast pork) topping. Most places give you just a tiny slice which is very thin and usually dry having been sat out in a box all day......a BIG no no in my book. And sweetcorn......forgedabowdit! That's for the tourists so you'll find a lot of Ramen Restaurants around the downtown areas of Sapporo like Odori and Sapporo Station where they serve sweetcorn in the ramen. For me, this is a sign to stay away. Also, it's best to avoid Ramen Alley in Susukino, definitely a tourist trap. 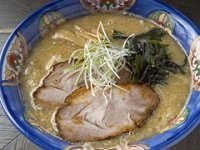 The best ramen restaurants that I have been to are usually out of the main areas and a little difficult to find, but it's definitely worth it. If you find a place where there is a big queue out the door and the waiting time is about 20 minutes, you've found a good one. If it's quiet and empty, there's a reason for that and your mind should be screaming "No, no, no! ", no matter how hungry you are. Sakurajima make their own noodles, roast their own pork and give you very generous chunks that are juicy, succulent and melt in the mouth. This is my 100% my favourite Ramen restaurant in Sapporo. At lunch times there is always a huge queue going out the door and can be up to a 15 minute wait but people usually go their by themselves, so the turn over is pretty quick. You will see a mean looking man with a bandanna and a silver mustache quietly kneading noodles in the kitchen. He's very friendly apparently. This place is quite out of the way from Sapporo Station which is, sadly, why I don't go so often. But, if you make the trip out there, trust me, you won't regret it. The soup is based on pork bone and is delicious. The pork is tender on the inside and crispy on the outside combining perfectly with the thick noodles. 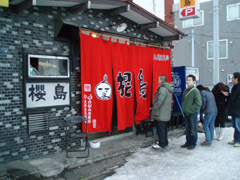 The owner Tetsuya Utsumi has six establishments in the city. It takes approximately 7 minutes by foot from the Streetcar 6-jo Station. 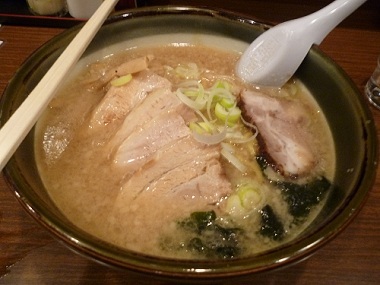 Alright, so I mentioned earlier that because there are so many ramen shops in the downtown area, namely Susukino, that it was hard to find a good place. Well, i have found one right in the heart of Susukino, not down Ramen Alley by the way. Meijinbou serve my favourite kind of Japanese noodles; Kakuni (braised pork belly). Yum yum and yum! 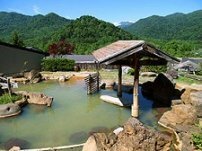 Know Any Good Ramen Restaurants in Sapporo? Found a hidden gem? Share your review about the Ramen restaurant you dig the most!